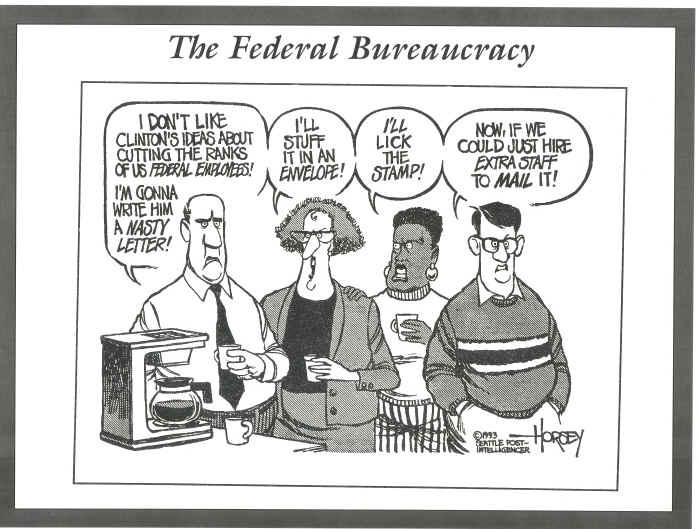 I'm so caught up in Bureaucracy, I've actually met some of these people. As I write this, I'm on the Purple line train on Chicago's metro system - the "El". I'm headed back to Evanston from the Internal Revenue Office in downtown Chicago. Getting a bank account set up for my business is proving to be a headache. 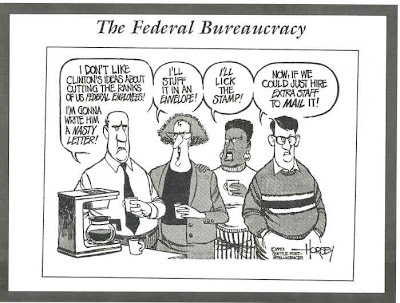 With the school Winter quarter kicking off next week, I'm feeling a little pressure to get administrative issues resolved before my endless list of things to do gets even longer. It all started simple enough -- I just want to open a bank account so that I will be able to cash in money from customers. I got a few recommendations for banks. The mainstream consumer facing banks, such as Citibank and Chase, charge monthly fees. For a business with little revenue, I found this a ridiculous proposition. The Levy Center kindly pointed me to a few banks that offered better terms -- TJMcCue First Bank & Trust, Harris, and Charter One. Of these, Harris was the most interesting, in terms of keeping my fees at zero. To open an account, I found I need an Illinois Tax number for the business. So how do I get this number? The Illinois Tax number need to be applied for from the state revenue department. However, to get this number, I need another number -- the Employer Identification Number (EIN). The EIN is the federal level number that identifies your business for tax, employment and other business purposes. While I pondered why the state needs a different tax number to the federal government, I began looking around for how I might get a EIN number. Fortunately, the EIN number can be applied for online. Unfortunately, the online form is only available during office hours(!)... you can imagine how crazy this must make a person wanting to apply for such a thing at 11pm at night. So I waited until the morning and started filling out the online form. As I filled in the boxes and moved from one screen to the next, I eventually got to needing a number that seems to be the root of all things US -- the social security number. Because I was not employed over the Summer, and was instead working on the business, I didn't get a social security number. It appears I need a Individual Taxpayer Identification Number (ITIN) in its stead. The application for the ITIN is via postal forms. Following phone calls to automated voice recordings and angst that it could take weeks to get this numbers, I'm headed to the Inland Revenue Office to see if they can give me a helping hand. I don't have anything to file for a tax return, which is when an ITIN number is typically filed for. To reduce the risk that I didn't have all the document I needed my visit to the Inland Revenue Office, I decided to empty out my desk tray of important documents into my rucksack. At the Inland Revenue Office I was greeted by a sign that something to the effect of, "Due to weather, traffic and staffing issues, we are only accepting tax payments. Please come back at another time for everything else". A receptionist imparted some advice, "You think you can just walk in here and get an ITIN number? It's a long detailed process that will take 12 weeks. It requires a lot of homework". I almost cried.